Novomet was visited by a delegation of oil companies. Representatives of LUKOIL-PERM and Irkutsk Oil Company (INK) came to share their experience in oilfield operations in modern conditions. LUKOIL has long been cooperating with Novomet. This time they decided to introduce their partner to a manufacturer of equipment successfully applied in the oilfields of the Perm region. 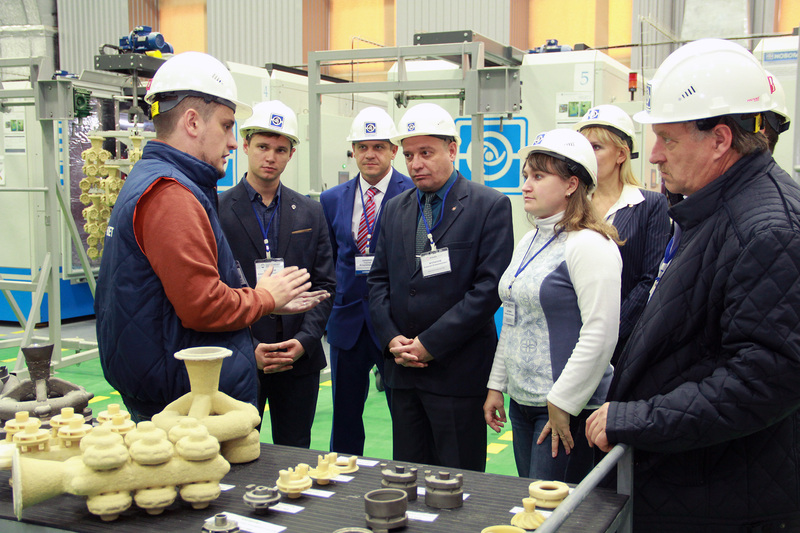 The guests were given a tour to metallurgical and machining facilities and recently launched foundry. Then they participated in the seminar where the experts from Perm city shared their experience in solving problems related to operations of artificial lift equipment in severe conditions. Novomet demonstrated its innovative developments for operations in fluids with high solids content, scales deposits, and the algorithms smart control for performance optimization of well operations. The participants discussed technologies aimed to reduce costs using energy efficient ESP systems and the possibility of operations in environments with high hydrogen sulfide (H2S) content. Novomet has solid experience in manufacturing ESP systems resistant to sulfide stress cracking that might happen in drowned wells with the presence of hydrogen sulfide, which significantly reduces equipment runtime. Numerous metallographic studies, laboratory analyzes, improvements in materials and design, as well as the experience of operations in severe conditions allows Novomet to be ahead of the competitors in the production of reliable equipment resistant to sulfide stress cracking. Visitors highly appreciated manufacturing capabilities and technologies of Novomet and expressed an interest in further cooperation. And agreed to study the possibility of trial operation of Novomet new developments at the oilfields of Irkutsk Oil Company.